In real time, Joy and Austin Forsyth have moved out of their borrowed camper and into their new house, which they fixed up together during their first months of marriage. You can see the near-finished product in the video tour we posted two months ago. And if you haven't heard, new episodes of Counting On return this summer, so there is plenty of newer footage coming your way. Until then, check out this video that shows the early stages of the renovation, as well as the Forsyths' plan for the house. They appear to be making major structural changes to the house. I hope they had permits to do this and the work was inspected by the local building authority. Where I live, a permit and inspection signing box has to be displayed in front of the property during the renovation. I don't see one here, and have never spotted one on the show. I live in a new subdivision that's just being built and I have never once seen any papers displayed. So obviously every region is different. A. I don't think they would break the law by doing unpermitted work. B. I'm pretty sure they wouldn't be posting photos on the internet if they were doing unpermitted work. There has to be a doc box (document box) at every project so the different inspectors have somewhere to sign off on the work with date and who inspected. And this is your business why?? Kudos to Austin and Joy for having the gumption to do a major house renovation!! That takes guts and lots of time and muscle, GREAT job!! It's everyone's business if houses are inspected and renovated properly. Eventually, those properties go on the market. You can't have a town full of houses with questionable construction. Nor do you want to buy a house for yourself without knowing its history and that it's in a safe condition. The codes and inspections are there for a good reason. Do-it-yourselfers can make more problems than they solve if they're not careful. The bathroom comment was a good one. I still don't understand why haters spend their time following the duggars. They are obviously Drawn to them and interested in finding out what they do in their every day lives. This all sounds like high school immaturity. I don't know why they didn't take a bulldozer to that place and start from scratch. And I'm amazed to see either of them in there without dust masks on. Yuck! Why would they need dust masks? They're young and healthy. I disagree. It's usually less expensive to renovate a house than to start from scratch. 6:11- You use a dust mask so you keep on being healthy, no matter how old you are. Old houses can harbor all kinds of nasties- mold, lead paint, asbestos- you never know. That's fiberglass insulation being ripped out and lying around in shreds. You don't want that stuff in your lungs. They should be wearing masks. 6:11 -- So only old people need to protect their lungs? A mask,helmet and glasses! This is not safe. I kept waiting for someone to step in those holes in the floor. They should be covered with plywood with the edges sprayed neon orange, and marked as loose! @6:11---exactly the reason to wear a mask---to stay young and healthy!!! Lol did someone say that they don't have to wear a dust mask because they are young and healthy? Really? They said in the show he flipped a few houses before he married but I looked in the property records and he hasn't owned any properties the last flip before he got married. I'm thinking they will now start working at the camp to support themselves (plus tlc and magazine income). Nice looking house, but they should complete the railing around their porch before Gideon is old enough to crawl. Are they doing all this work themselves? It would be nice to know if they've hired others or have family members helping out who are licensed professionals to do the electrical, plumbing, etc. Renovations notoriously take at least twice the amount of time you think they will. Maybe it would've been a good idea to concentrate on having the house in order before planning a wedding and honeymoon. (Just an opinion!) I'd have enjoyed those special times much more knowing I had a livable house to move into afterward. They seem to be making a number of structural changes to the house which would require changes to the wiring and plumbing. The Duggars never seem to be forthcoming about who does the electrical and plumbing work or if they have permits for these activities to say nothing of building inspections that the rest of us need when doing this much work on a house. I don't question their work ethic, but do worry that this house is not up to building code. But then they wouldn't have had Gideon!!! I highly doubt that the TLC crew legally would enter a building that is not up to a code. 5:54 -- Do the Duggars or the Forsyths owe you an explanation about every little detail in their lives? Don't worry about it! If your house is in a city you need building permits for any little change you make to your home. When you live in a town there will be less permits required, usually only for sturctural changes require a permit. When you live way out in the country you are free to build what you want to. Arkansas laws are different then many other States. We live in the country in Ohio, and we cettainly have to get permits and follow building codes. Foundation inspections, framing inspections, electrical inspections, plumbing inspections, etc. I highly doubt they're "free to build what they want" without permits and inspections. Just because you don't see the permits, doesn't mean they don't have them. Why assume the worst! Good for them. I wish I had the tools and knowledge to do something like that. I think they work hard, but I hope they are following the rules in their county for the amount of structural changes they made to the house. I think it's time for me to say goodbye to this blog. The negative comments on the past several topics have been ridiculous. It's one thing to offer kind constructive criticism. It's another thing to be downright rude and nasty. I have been tempted to give such people a severe tongue lashing but that is not how the Lord would want me to react. I will miss many of you. I'll miss Neddy most of all. She is always a breath of fresh air! I agree! It's so strange that people who call themselves Christians are so critical. I love Neddy's comments too. The negative comments drive me crazy too. That is why I just look at the pictures and read what is on the blog. I'll glance at the blog and if it's rude comments, I don't even look most time. But I love hearing all the good encouraging words that people say. What I don't get, is why do people like the blog if all they do is leave negative comments. You’re leaving this blog just because of some comments? Why don’t you continue to visit the blog and not read them? I’m sorry, I just can’t understand why someone else’s comments would make you stop reading...? I read many articles with differing opinions, but just because they aren’t all the same opinion or they differ from Mine doesn’t mean I stop reading. I know, the duggar haters have taken over the blog. It's so sad they are ruining this blog. Offering polite but different opinions is one thing but endless nitpicking and harassing this family over the smallest things is ridiculous. Due to all the negative and awful comments and bullying this site is no longer a site for just "factual and encouraging updates" on the family. It's being overshadowed by those who want to tear down the family because they hate what the family stands for. The secularists and anti Christians have made it there mission to destroy this family and don't talk to me about Josh. The ones making all the terrible comments are lately are directing their negativity onto the innocent victims of Josh. Sorry to read that, but I understand. I see a warning that derogatory comments won't be posted. But much of what I see posted here is very derogatory. Someone even commented that certain Duggars would be on welfare after the show ends. While usually others post to defend the Duggars too, there's been a lot of uncivil dialogue recently. More than Id expect for a moderated blog. Realistically, I think "haters" make up a very solid portion of this family's fan base. Without them, the show would probably have died off years ago. I agree, I love Neddy also. And you are always so sweet in your comments, Regina. Oh, Regina. I know what you mean about wading through these comments and being dragged down by the negativity, but you are one of the few breaths of fresh air around here as well! If you go, I'll really miss you. 9:21!! I totally agree. It’s so funny to me all the “haters” can’t figure out how this show, which is incredibly boring, keeps being renewed. I laugh and think “it’s you”! Their strange fascination with hating this family is actually keeping the ratings high enough to keep the contact going. Regina, I feel the same way! Sometimes the constant negativity can be discouraging. I do enjoy your comments and neddy’s as well! Edifying and positive! I think the "haters" are "fans" who are just critical by nature and are always looking for something to pick on. We all know those people, don't we? Don't let them get you down. We can always correct lovingly and gently, as I have seen a few people do here with great diplomacy and tact. I wouldn't call haters fans. But I agree they do make up much of the show audience. For those who claim the Duggars are fair game for judgement because they are public figures. I know not all who post are Christian but where does it say in the Bible that celebrities don't deserve any Christian charity. Jesus is very critical of the Pharisees but they were leaders who were abusing their powers. The Duggars may be role models to many, but they are not politicians or Church elders. Don’t leave, Regina. The only way to conquer the negative criticism is with positive feedback. You are so good at that! If all the good people stop responding on the blog, then what is left will be very sad indeed. Hang in there. There are more of us than them. Normally I'm not a commenter but the rude and excessively picky comments inspire me to post a positive comment even though it's very tempting to tell those people to hush up! More positive, less negative. Some people need to touch and be touched. There's nothing weird about it. They're newly married and obviously very much in love. Touching is a way of showing it. If you find it offensive, maybe you just shouldn't watch anymore! Also rude to criticize a newlywed for being affectionate with her husband. Exactly @2:29. Joy is rude. Did you watch the episode when Joy and Austin said they had a baby name picked but were keeping it to themselves? Joy, in her snotty tone, waived her hand and said “we don’t want anyone’s opinion”. She turned to Austin and said “right”? He said yes, but told her she can say it nicer!! I though good for Austin! Yes, nobody needs others opinions, but things can actually be said nicely. Something Joy does not grasp. 2:29 -- Read Love Languages. Some people love to touch and be touched! She is the one mainly doing the touching, not him. 11:21..I saw that too. I actually cringed a little when Joy said that, and cringed again when Austin corrected her. I’m not a fan of husbands or wives correcting each other, and on tv too!, as it then becomes a parent/child type relationship, but in this instance I thought Austin was totally right. Honestly, Joy-Anna has been unpleasant since the whole wedding dress shopping episode. She comes across as a typical spoiled teenager who just happens to now be a 20 year old wife and mother. Seems like Austin was right when he said “we can say that nicer”.....many people on the blog could say things nicer as well. How about everyone read and re-read their post before they hit publish. It’s ok to make suggestions or say you don’t like something...just make sure we are communicating with love. I'm really proud of Austin for providing a house, of his own endeavors for his family. Very attractive, and Joy will make it a home. I agree. This very impressive! And being someone who likes to be creative, I totally understand how one makes a project work in his/her mind, but in reality the plan is much different. To make something of your own offers endless learning and is very rewarding. I admire this couple very much. Congrats on your house being done Joy & Austin. Hey Joy and Austin!!!! Great job, and your home is wonderful!!!!! Joy needs to go back and talk to her mom some more about being submissive to her husband and following his leadership. Since Joe helped Joy accept her parents' faith, that's all part of it. Joy was not being unsubmissive. If you listen to her during the video, she is actually asking Austin questions....so this is where the island will be? And we're going to stain the kitchen cabinets to make them look older? She is confirming the plan with him not telling him what to do. The only thing she disagreed with him on is the closet. Women tend to think of storage as more important than men. Her concerns were justified. She wanted to actually be able to hang up her clothes and not feel like she was still in the motorhome. She wasn't mean or unkind at all, and they kissed right after. Do you really think Austin thought she was being bossy? So then he kissed her? He knows her personality and loves her. Joy has been pretty sassy lately, I agree. Surprising, coming from a Duggar. I would like to ask you if your submissive to your husband and follow his leadership? (If you're married that is) if your not, maybe you'll understand about marriage better when you do. Anon @ 5:07 I have been married almost twenty six years and am not submissive to my husband, never have been, never will be. We are equal partners and make joint decisions, sometimes someone has to compromise but never submit. This kind of comment makes my skin crawl. Marriage should be a teamwork. A married woman still can think for herself and have opinions on her own. A good husband should listen to his wife and make plans WITH her, not for her. Joy has a right to voice her opinion on her own home. Submitting isn't the same as blindly following and never asking questions. The husband - wife relationship is NOT a parent - child one. Abigail even sent a peace delegation to David while her husband wanted to kill him. Yet she was not punished for being unsubmissive. Granted that'' an OT story but Duggars do follow it. I am sure Michelle has asked Jim Bob questions. Though she might disagree with doing so in public. Husbands and wives need to submit to each other. Ephesians 5:21 and husbands need to love their wives. ephesians 5:25. That doesn't include making them wear tight ski boots. They have done a great job! They are hardworkers! I don't think it's at all crazy or sinful to go to college or trade school, or put off marriage until you're on sound financial footing. "Getting married" is not the opposite of being sinful and crazy. Plenty of married people are full of sin; plenty of unmarried people live wonderfully. Lest you're calling poor Jana sinful!? I fail to see any connection between age, marriage state, and being sinful. Being older or being married doesn't automatically keep you from sinning. You keep yourself from doing that, and you can do it at any age, starting when you're a kid. And how would your statement apply to someone like Josh, who was married when he went the way of the sinful crazy world? Don't get defensive. The poster was just implying that it was nice to see people actually get married before they just sleep around with who all before they actually find the one they'll get married too. I agree totally. It's the godly biblical way. I admire this loving christian family ! @11:53AM. Why would you bulldoze the house??!! I think the outside looks cute and the inside they have worked on. Enjoy your home Joy and Austin. I love the new banner! Very cute home! It looks really nice inside! I do have to wonder how many people actually worked on the house though. 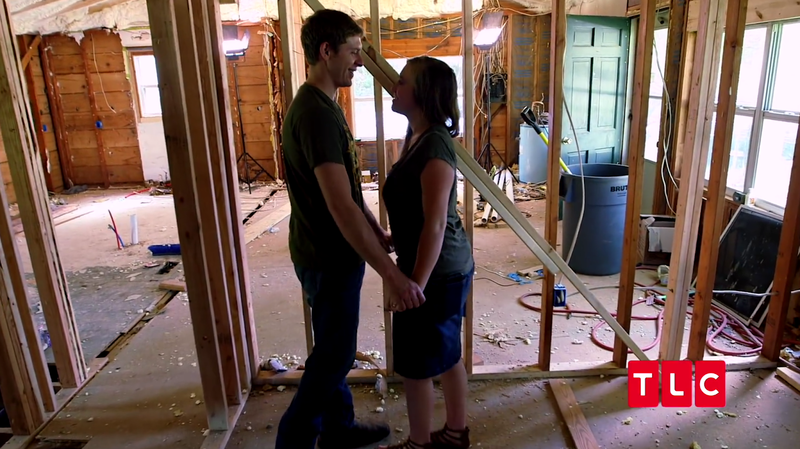 I'd be very surprised if Austin and Joy did all the work, or even the vast majority, themselves (or how safe/smart that was with her being pregnant-fumes, demo dust, construction dust, etc.). If others did work on the house, it's dishonest not to acknowledge them and their contributions, while floating this as Joy and Austin rehabbed the house themselves. If you watched the show, you would see Joy's brothers helping sometimes. They don't have to acknowledge everyone on the show who helped. I have never heard them say we did 100 percent of this by ourselves. Question: On the episode where they ere making some meals to freeze for before Joy had Gideon, whose house were they are for that? Was that this house in its finished state? Just curious. 🙂 Thanks!! I admire Austin' vision and commitment to the huge project. I was surprised Joy was negative to Austin about the closet and time to complete house would take - I felt it certainly was not encouraging Austin. Lack of believe in his words and skills but I guess with maturity she will change. I thought it was a little pretentious of Joy (who's never flipped 1 house), telling Austin what he could not do. Her immaturity and "bossiness" (from her early teen days telling her younger siblings what to do) cropped up. I loved the way Austin handled it though-he was more than gracious and gently reminded her he knew what he was doing. I was embarrassed for Joy-I don't think she even realized that she (who knew far less), was telling the guy who's done this a lot, how to do his job. She's still pretty young and hopefully she'll learn a little humility along the way. Kudos to Austin-most husbands would have schooled her. It's great for Joy to have an opinion and input; telling Austin (or anyone with more experience) how to do his job-not so great. Congratulations Joy & Austin!! Don’t listen to the haters on here. It’s easy to be brave behind an anonymous name & behind a screen nobody can see you from. SMH. You 2 are so young & doing a very responsible & grown up thing! God bless your hard work & big heart. If comments go through approval ... why let all these anonymous knuckle heads post negative comments? Joy does not talk to Austin the way Michelle talks to Jim Bob. It comes across as a little disrespectful, doesn't it? Joy admitted to the challenges, new feelings and hormones that she was struggling with in the pregnancy, all new to her, this was filmed during that period. Pregnant friends have gone through the same and went to their sweet self after delivery. Poor Joy dealing with that as a newlywed. Same for Austin. Now, she is her sweet, considerate, giving Joy. Before pregnancy she wanted NOTHING for her, her happiness was Austin's happiness, very unselfish. Not fair to judge a hormonal period all women get during pregnancy, all kinds of mood swings! It amazes me how mature they are for being so young. That beautiful 1st home was done with patience and solid teamwork. Not many 40 y/o married couples would have their work ethic, determination and love to put into that project. Austin is a good sturdy, intellegent husband and very good teacher to Joy and she is an eager learner and well rounded from her upbringing. I am ecstatic for these wise-beyond-their-years young couple!=) I hope for lots of sweet pictures of them and precious baby Gideon! I think they are a nice young couple and have strong work ethic, but it's like they were born on third base and believe they've hit a triple. My husband and I bought a house shortly after we married. It was several years before we could afford to do any renovations to it. Although we did most of the work ourselves we were "weekend warriors" while doing them. There's no indication that Austin and Joy had to juggle jobs and finances in their home purchase and renovations like the rest of us did when first starting married life. How can you say that? They worked on it on nights and weekends, and it took months to complete it. 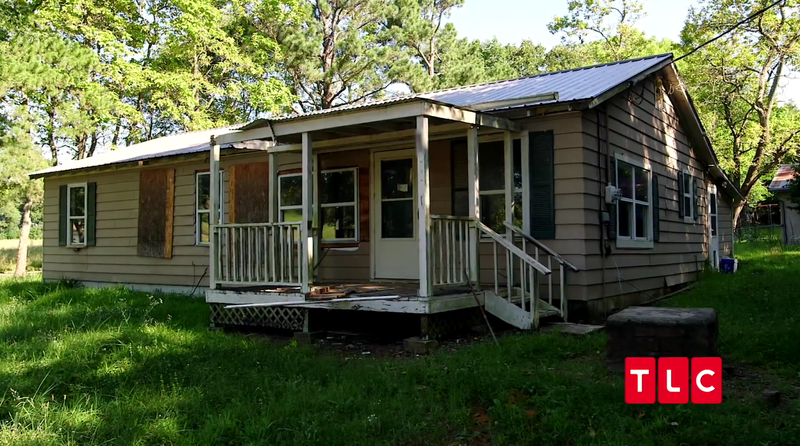 She said during the video that they had not been able to work on the house as much as they had wanted to due to helping with camps, etc. Maybe your house was more livable than their house was, so you could wait for the renovations. Austin has flipped several other houses, so he is very comfortable doing them. It they were rich, don't you think they would have just hired a bunch of people to fix it and moved right in. They wouldn't have lived in a motorhome for months. So true. Most cannot afford a home at such a young age but then she's been a TV personality for many, many years and that's gotta pay well. And praise God for that. Why be annoyed because they had the opportunity to purchase a house and renovate it without having to juggle jobs. I don't understand why people get a little irate with others because they 'apparently had it easier' as if those people forced them to make their 'bad' choice. Those negative comments about posts don't bother me. What does bother me, though, are the people who call other posters names, or complain about what they've posted and judge it to be negative. I find that much harder to take than a comment about what's happened on the show, good or bad. Not everything on the show is worthy of a positive comment! You know there have been moments that made you wonder what the producers were thinking for making the kids say certain stuff or show certain stuff. 3:44, excellent comment. As I’ve said before, just because someone doesn’t like something the Duggars do, it doesn’t mean they are nasty or a hater. If the only comments posted were ones that are full of sugar and rainbows, this blog wouldn’t be interesting at all. I enjoy a good debate as long as people are respectful in the process. I think the moderators do an excellent job of keeping out truly nasty comments. Please be respectful of the job they do. Or you can always stop following this blog. totally agree. the nitpicking is insane. In previous episodes, and seasons they told of the jobs each of them do. These are facts I gathered just from watching the show, Austin not only is a pilot, but a trained EMT, He works at the family camp his dad started. He wouldn't even propose to Joy until he "flipped" his 5th house, because that is also what he does for a living. He wanted to make sure he was able to provide before starting a marriage, and family. Jim Bob requires them to able to provide before giving his blessing to marry. Joy from what I gathered works, for her dad's business, and now the family camp too. Just because we don't see everything on T.V. doesn't mean they are without jobs. Austin seems responsible. Jim Bob raised all of his children to be wise with money, and not lazy. I'm sure the little ones are being raised that way too. Joy explained they were busy honeymooning. Austin flips houses for a living. It seems perfectly lofical to me that he has the resources and experience to renovate his own house. Joy's family deals in real estate for part of their living. If you watch their show you've seen the family all pitching in to fix/repair the properties so,that they can be rented or flipped. Houses that family members are living in were all part of the family real estate deals and received the same kind of renovations. Joy said outright in the video it was taking longer due to work commitments at the camp and probably for her family, too. I think if you look at how long it took them to complete their own home, they were not working on it full time. When Austin was flipping a house he could spend more time on it because there would be profit at the end. The camp is seasonal and they are part of the operational team at the camp, I’m sure they are paid for their work there. Gosh I would be offended if someone questioned my personal finances the way Joy and Austin are being questioned. I think they have done a beautiful job with this house very talented. They amaze me to be so young, and be such hard workers. A lot of young adults are not focused on responsibility.Lilly and Ellie: I know it is near impossible for you girls to read and filter every comment. Y'all do a great job on the blog. I have been reading and commenting for awhile now. I does seem like there is more negativity posted lately and assumptions made, and criticism of this family on here than usual. As fan of this blog, I would love to see the more uplifting comments posted. I enjoyed coming to.this, because the media is so negative and gossipy about everything . This blog is clean and family friendly. But lately I have just seen such ugliness. It is my request as a reader, that more of the good get posted. I just feel like true fans shold uplift and encourage this family. Pray for them. Thanks for keeping us updated! Maybe she should post something like "only positive comments will be posted" so keep things positive. Honesty is important. You can’t be asking them to hide or sweep under the carpet negative comments...right. I like to read the cross section of comments both positive and negative. Thank you Lilly and Ellie for honestly showing what the public is saying. If we don’t agree with a specific post, we can direct a response to the poster. Please don’t over edit. This show and this family is not perfect - they've said so themselves - and the conversation on this blog should not be artificially made perfect either. Kathy, I enjoy reading your comments. You seem to have a very good head on your shoulders. I think people are entitled to hold their opinion but what I don't like is when people make stale comments about the girls dress and their beliefs and so on and they don't even know them personally. Also when for example Jill is seen a hotdog. It is the negative comments about her junk food choice and 'oh she can't cook'. This is boarding on silliness. Of course she cooks but like every house wife, you rather not cook at times. Those comments about the way the girls dress now will probably continue until the Duggars take the time to explain why their own "rules" changed, and explain it in a way that makes sense. Only then can things like that possibly be put to rest. Jill is seen a hot dog? Lovely house. I am a bit concerned because they didn't show any of the hassles people normally deal with while doing large scale renovations. Like getting work inspected and passed before moving to the next phase of construction and having the house certified for occupancy before moving in. Watching them deal with those issues would have been interesting. If the house wasn't certified for occupancy, showing off their handiwork on national TV probably was a bad idea. I agree because I think showing them dealing with those common challenges and how they handled them would have been interesting to see and something many viewers could relate to, having experienced it themselves. I think the number one complaint for a large number of viewers and the general public is they simply cannot relate to the Duggars' lifestyle changes in recent years. The show content is largely so far removed from most people's "normal". They've kind of lost some of their down-to-earth-ness that endeared them to their fan base in the beginning. Why in the world do you just assume the worst and think they didn't do everything legally? This is an accusation disguised as "concern". You should apologize for implying this. Austin is very impressive. He has such a good work ethic. @ anon 7:43. I don't think anyone is "assuming" that Austin and Joy did anything illegal, but showing off the renovation of their house without showing any of the hoops that people doing massive renovations are required to go through is a far cry from reality. It's as though they live some sort of life that is so far removed from the rest of the world it is just theater and they don't have to deal with actual problems. @ anon. You echo my thoughts on the Duggars. They had appeal because they seemed real people dealing with real life. Now Counting On is so divorced from the life most of us experience I just can't relate to them. This house is a good example. No one could have sailed through such a massive renovation without a few construction and supply issues or without inspections. Austin and Joy's presentation was nice but why the pretense that there were no snags and no inspections? I agree with most of what you have written. However, Catholics are Christians. They were the first Christians. You can't be serious. Any cursory reading of this site and it's clear that many people who read it enjoy making hateful comments. Yes, it's hateful to constantly make accusations like accusing them of not not getting permits, not working and being lazy, the pregnant women of not getting any prenatal care, and on and on. It's hateful to take the sweetest video showing the boys working and then a bunch of comments complaining that the work they do isn't good enough because they are working in their fathers business. It's hateful to see pictures of a beautiful wedding of Joe and Kendra and completely bash everything about them and the wedding. Only people who hate and want to tear down this family would spend so much time making accusations and bitter comments. Dugfan, I agree whole heartedly with your comment but I’m concerned by one thing you said. You said you aren’t a Christian; you’re a Catholic. I’m a Catholic which is a Christian religion. Some on this blog might disagree but that’s not for me to worry about. I know I have a relationship with Christ. I think it's just as "hateful" (hate that word) to your viewers to never explain what they're seeing or why. Ignoring explaining about the things you do as a Duggar begets bad comments. They have had the show long enough to understand that people want more information about what they're seeing or hearing. Yet issues continue to go unexplained. Pants, a piercing, traveling one day while asking for money the next, no mention of jobs but visible wealth, odd comments left on social media that seem to come from left field, and so on and so on... It's a public reaction to the way the Duggars themselves are handling their own public relations! Not sure I'd go as far as hateful, but it seems many who critique the Duggars have a "guilty until proven innocent" attitude. So they will assume Joy and Austin didn't get proper permits for their house, unless they can prove they did. They will assume the Dillards are lazy bums happy to live off donations from other people, unless they can prove they aren't. They will assume pregnant Duggar women are guilty of pridefully flaunting their baby bumps. People who have this attitude don't necessarily hate the Duggars, but they come across as very judgmental and not at all Christian. Because of this statement at the bottom of this site"Our aim is to post all points of view, but we do not post anything that is profane, insulting, derogatory, or in poor taste." Some people like to hear different points of views. Everybody judges sometimes yes even this family. Not saying its right but we all do it one time or another. They are so sweet together, but I’m sad by seeing Austin’s shirt. It is very unchristian to support apartheid, genocide and oppression to others. I would have expected more from the Duggars. WHAT?!! I think you need to study things a little bit more. The Duggars and their inlaws seem to love a controversial t-shirt or two! I agree with you. That shirt shows that the Duggers and in laws support a very unchristian agenda by supporting IDF. I believe Derick wore the same shirt when Israel was born. Sure, it was a nice pun, but the actual meaning behind it is so grossly wrong. That shirt is a contradiction to the pro-life movement. IDF kills children. Anyone who claims to be pro-life shouldn’t wear such a shirt. I for one am appalled. He was a young man with a purpose. Flip 5 houses and be secure financially. As for labour, they all come together with their various skills That saves a bundle As for safety, they have to pass inspection fog insurance.I think they are doing a great job! If the rest of the family "pitched in" to help with their skills, you'd think Joy and Austin would show them working on the house instead of giving the impression they did it all by themselves. Realistically you can't just flip 5 houses and be set for life. I think both Austin and Joy know that and will continue to work hard. My husband knows I love the Duggars but doesn't watch too much of the shows with me. Austin really impressed him though. My husband flipped a house when he was almost 30 and it wasn't nearly to the extent that Austin & Joy did. They're an impressive, hardworking, young couple!